Why does heart-rending pain lurk in the back of the wealthy Countess of Sinclair’s eyes? 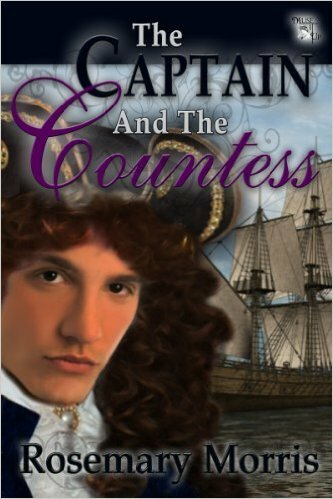 Captain Howard’s life changes forever from the moment he meets Kate, the intriguing Countess, and resolves to banish her pain. Although the air sizzles when widowed Kate, victim of an abusive marriage, meets Edward Howard, a captain in Queen Anne’s navy, she has no intention of ever marrying again. However, when Kate becomes better acquainted with the Captain she realises he is the only man who understands her grief and can help her to untangle her past. One of the things I always desire when reading historical romances are underlying themes that are enduring and that help give hope to readers who may be struggling with problems of their own. In The Captain and the Countess, this is splendidly done with the theme of escaping domestic abuse and the power of motherhood as the heroine seeks to escape her painful and abusive past and searches for the children stripped from her care. Poignant and riddled with tension, I enjoyed this story very much. As all her novels, Rosemary Morris has sprinkled her powerful tale with vibrant characters, lush descriptions, and a heart-wrenching storyline. She is one of my favourite historical romance writers! A truly lovely tale!